The Fund for Assistance to the Russian Orthodox Church Outside of Russia has supported the ROCOR mission in Haiti for some time (see article in our December newsletter). There are about 3,000 Russian Orthodox Christians in Haiti, and the number constantly increases, owing to the tireless missionary efforts of the island’s two Russian Orthodox priests, Fr. Jean Chenier-Dumais, and Fr. Gregoire Legouté. The faithful gathered in tiny rented buildings for services, the priests shared one car to travel for hours across the country on unpaved roads across mountainous areas in order for parishioners in five parishes to lead some form of church life. There is no social support system in the country, and people have to rely on the Church to provide education and healthcare. One of the mission’s schools (Le Foyer d’Amour in Port au Prince) educates mentally and physically handicapped children. In 2009 the generosity of ROCOR donors made it possible for the mission to pay rent on their rented church property, assist eight families to overcome the effects of the hurricanes of 2008; pay tuition and scholarship for 183 children from poor families; subsidize parish schools; pay for priests’ trips to parishes, and pay priests their salaries. 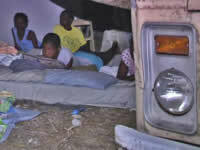 However, before this disastrous earthquake many families still lived in houses wrecked by the hurricanes of 2008. A list of their needs included money for rent, tuition, for the purchase of land to build a church, a clinic and health center; pay priests’ salaries; buy another car to enable the priests to travel to parishes; repair houses wrecked during the hurricanes. The mission was in danger of dying out. The recent earthquakes have of course made a dire situation worse. Rev. Victor Potapov spoke to the ROCOR delegation in Haiti several times. They have set up a makeshift clinic at one of our churches in Port-au-Prince and is already running out of the supplies that he brought in from the Dominican Republic. ROCOR donors have collected over $50,000 and more donations are coming in daily. We hereby remind our faithful and other potential donors that every dollar allocated by donors to a specific project goes to that particular cause. This has been the trademark distinction of the FFA since its inception. A donor could designate funds for a particular church, monk or nun and they would be sent. FFA overall expenses are kept to a minimum and are funded out of general contributions. The ROCOR provides the office and equipment. We remind all of you of this history and renew our pledge to you that your contribution to Haiti will go fully to Haiti. Please feel free to contact us by email at info@fundforassistance.org or at 917-817-2925 with any further questions.